This is a Surveillance Camera with 140° Wide Angle Lens wireless for Home Security: This HD 1080P wifi clock looks like a normal clock. You can put thison the desk and it is totally not noticeable while the it is recording. 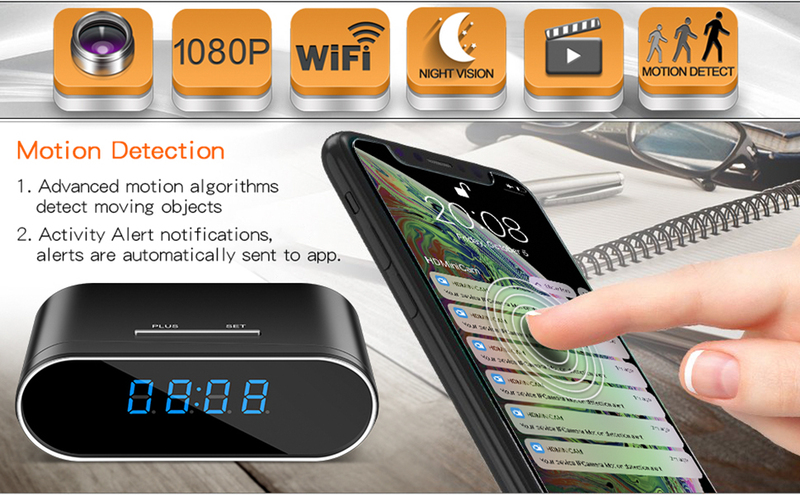 Wi-Fi Streaming Via IOS/ Android APP: This wifi camera wireless hidden cameras in clock could be connected to your home wifi internet network, by this way, you could view the image of your house, kids, pets or elder from no matter where you are in the world. You are going to see everything is happening through your phone, tablet or computer. This is an excellent IP camera. Motion Detection & Night Vision & Alarm Push Surveillance Camera: This mini surveillance camera alarm clock was built-in 12 night vision IR, you can see faces and some details even in a dark room, When someone comes around your house when you’re not there. Alarm notifications will be pushed to your cell phone as soon as the motion is activated. And the spy camera will capture a snapshot for the motion detection and save in the APP. Does the clock really work and keep time? Yes, of course. This wireless camera could does its job and show you the correct time. Hello, I want to monitor live stream and also have it upload into spme kind of cloud, is this posible ? When the card becomes full will it start over / rollover?